Collectors of Porsche miniatures can count themselves lucky that the range of models available from the Zuffenhausen-based sports car manufacturer is almost limitless. The story of these miniatures began with exquisite and already expensive sheet metal models made by the companies “Gescha” – which we will come back to later – “Neuhierl”, “Bach” and “Niedermeier”. Although the Japanese industry quickly followed suit with some fabulous miniatures, they would only win the favour of collectors much later on. By the middle of the 1960s, however, their glory days were already over. Complaints from consumer protection groups and concerned parents began to mount over the risk of injury from sharp metal edges. The children didn’t mind, because the sleek new models made of die-cast metal and plastic made the metal cars look old. Anyone looking back at the beginnings of their collection today will certainly remember their very first model car. In Germany, this may have been a “Matchbox” car, but more often a model made by “Sieper Kunststoffe” – or “SIKU” for short. In 1951, this inventive company from the Sauerland region recognised the enormous market potential of model cars. First they introduced a large fire engine, followed by fantasy racing cars and an impressive amphibious vehicle. However, from 1954 the era of expensive large-scale models began to come to an end. Cars in the 1:60 scale, which the company still favours to this day, were simply much better suited to mass production. SIKU said goodbye to the production of large-scale models with a bang: In 1955, the company from Lüdenscheid presented its masterpiece, and the 356 with split window was launched on the market under order number 190. A truly impressive model in a scale of 1:16 which, at a length of around 25 centimetres, even dwarfed the metal models available at the time. The likeness to the original vehicle was very good, and with this model SIKU was able to prove its ability to perfectly master the handling of plastic, which was still a very new material. The 356 feels heavy in your hand. The interior is formed from an ochre-coloured metal plate, and the steering wheel is tiny. The front-mounted, gently whirring friction drive makes the model top-heavy, but at the same time ensures a particularly robust and high-quality appearance. Good traction is guaranteed thanks to the profiled rubber tyres on die-cast rims. But it is what’s on the inside that makes the SIKU model so unique – the removable bonnet conceals an authentic, functional four-cylinder flat engine. This is where the company Gescha comes back into the story. Back in the early 1930s, this firm from Nuremberg had patented its "Transparent engine". Our inventive company from the Sauerland was so thrilled with the engine that they negotiated with Gescha a licence to manufacture a removable flat engine with a similar design. The children watched, astonished, as the pistons – driven by a sophisticated series of gear wheels connected to the rear axle – whooshed through the cylinders of the transparent engine block. SIKU had therefore not only added a stunning model car to its repertoire, but an educational toy at the same time. It was presented in sensational packaging that not only showed the Porsche in highly dynamic driving situations, but also illustrated the workings of the removable replica engine. Unfortunately, production of these giants was discontinued after just a few months, and only a few of the fragile plastic models survived the rough and tumble of the playroom and the street. Among the models by the Zuffenhausen-based sports car manufacturer, the Blue Mauritius is therefore extremely rare today; well-preserved examples in their original packaging are being traded among enthusiasts for high four-figure sums. Bernd Pennewitz makes iconic Porsche replicas—in miniature form with electric drives. 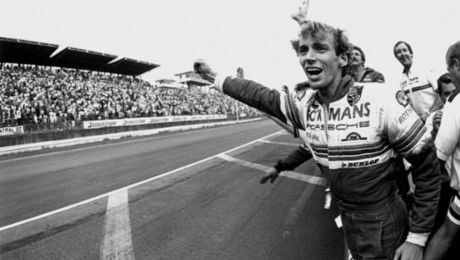 For many years, Stefan Bellof was considered the greatest talent produced by Germany.